When analyzing a commercial customer in FINPACK there are several tools available. 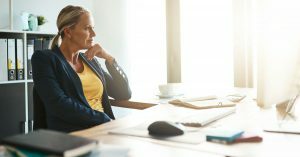 Deciding which tool best fits the analysis needed is important to get the optimal information, in order to reduce risk in the customer credit decision. The type of business and customer information available will drive the commercial analysis tool used. Commercial & Industrial (C & I) Business Analysis – this tool uses data from the business income statement or tax forms and corresponding balance sheet to analyze the business on a common sized and percent change basis. In addition, RMA comparisons can be used to further analyze the business versus its peers. This analysis generates common debt coverage, liquidity, leverage, and efficiency ratios and a UCA cash flow as well. Commercial Real Estate (CRE) Analysis – this tool analyzes the key metrics for an income producing, investor-owned (non-owner occupied) real estate property. Historical tax or income information can be spread and compared to projected net operating income, or a new property with no history can be analyzed as well. This analysis tool also analyzes the supportable loan amounts and vacancy rate thresholds for a property. The information can also be stressed to fully analyze the impact of vacancy, rental rate, and interest rate scenarios. Global Cash Flow – this tool is used to calculate debt coverage ratios for multiple businesses and borrowers/guarantors personally. An analysis is completed on each business and person in borrowing group. All information is then combined to analyze the overall use of cash and the impact on global debt service. 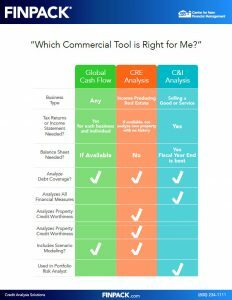 To help you determine the best tool for analyzing your commercial credit, we’ve developed this chart. Using the right commercial credit analysis tool for each customer situation is the first step in reducing risk in the credit decision process.